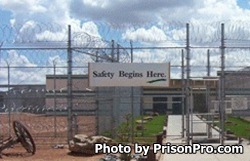 Guadalupe County Correctional Facility is located just outside of Santa Rosa New Mexico. It is a multi-custody facility designated as level III and level IV security. The prison is privately run and operated by the GEO Group, Inc. The capacity of Guadalupe County Correctional Facility is 600 inmates. Offenders are kept secured by two perimeter fences with a 24 hour armored vehicle patrol and microwave intrusion detection system. Inmates at the Guadalupe County Correctional Facility are housed in two medium security housing units comprised of double cells or a county detention area. Offenders who are difficult to manage or have safety and security concerns are housed in single cells within the administrative segregation unit. Visiting is on Wednesdays, Thursdays, Fridays, Saturdays, Sundays and Holidays from 8:30am-3:30pm.